A new year has begun! Like our list of Best MG and YA Books in 2017, we went to our WriteOnCon team and asked them: What books are you most looking forward to in 2018? Below, in order of date released, we’ve compiled a list of the MG and YA books that got a shoutout (with their publishers’ blurbs). Again, you may see many of our contributors’ names here — and that’s because we’ve asked a lot of these authors to join us for WriteOnCon 2018, and many of them said yes! We tried to focus on debuts, standalones, or first-in-a-series books, but obviously we are insanely excited to get our hands on War Storm by Victoria Aveyard, Daughter of the Siren Queen by Tricia Levenseller, and A Sky Full of Stars by Linda Williams Jackson… on and on and on! So many sequels! 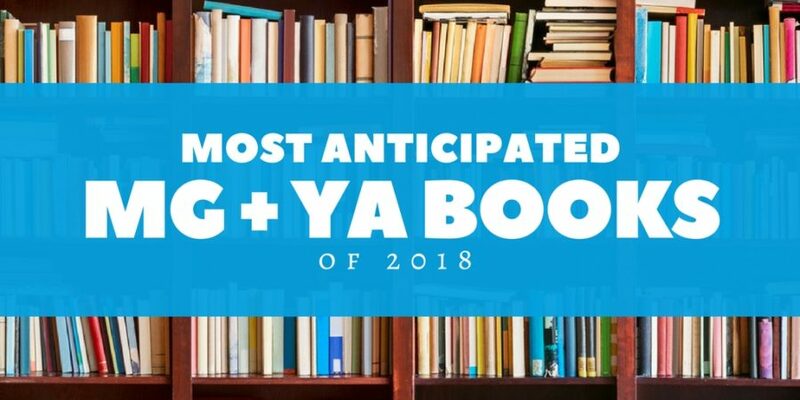 So, add these great reads to your TBR list — then go to the comments and tell us what 2018 books you can’t wait to read! Fans of Serafina and the Black Cloak and The Night Gardener will devour Shadow Weaver, the first in a dark middle-grade fantasy duology that’s filled with shadows, danger, magic, and has the feel of a new classic. Emmeline’s gift of controlling shadows has isolated her from the rest of the world, but she’s grown to be content, hidden away in her mansion with Dar, her own shadow, as her only company. Take the hilarious, magic-infused world of Eva Ibbotson’s Which Witch, add the lovable feuding family from The Incredibles, and you’ll get Wizardmatch — funny, fantastical, action-packed, and totally heartwarming. Now Lennie has her chance. Poppop has decided to retire, and his grandchildren are coming from all over to compete in Wizardmatch. The winner inherits his title, his castle, and every single one of his unlimited magical powers. The losers get nothing. Lennie is desperate to win, but when Poppop creates a new rule to quelch any sibling rivalry, her thoughts turn from winning Wizardmatch to sabotaging it… even if it means betraying her family. Comedic, touching, and page-turny, Wizardmatch is perfect for fans of Mr. Lemoncello’s Library, The Gollywopper Games, and The Candymakers. A room locked for fifty years. Paloma Marquez is traveling to Mexico City, birthplace of her deceased father, for the very first time. She’s hoping that spending time in Mexico will help her unlock memories of the too-brief time they spent together. While in Mexico, Paloma meets Lizzie and Gael, who present her with an irresistible challenge: The siblings want her to help them find a valuable ring that once belonged to beloved Mexican artist Frida Kahlo. Finding the ring means a big reward — and the thanks of all Mexico. What better way to honor her father than returning a priceless piece of jewelry that once belonged to his favorite artist! But the brother and sister have a secret. Do they really want to return the ring, or are they after something else entirely? A sparkling new series about two best friends on the adventure of a lifetime! Soon they’re adding links and building more forts, until Maggie looks behind one pillow too many and finds herself face-to-face with… the authorities. A standout middle grade adventure with a sassy, memorable heroine and a charming Southern feel, perfect for fans of Kate DiCamillo and Natalie Lloyd. In this contemporary story, Tash lives in Tibet, where as a practicing Buddhist she must follow many rules to avoid the wrath of the occupying Chinese soldiers. Lately, things have been relatively peaceful, as long as Tash and her family hide their religion and don’t mention its leader, the Dalai Lama. The quiet is ruptured when a man publicly sets himself on fire in protest. Soldiers break into Tash’s house and seize her parents. She narrowly escapes, and soon she and her best friend, Sam, along with two borrowed yaks, flee across the mountains, where they face blizzards, hunger, a treacherous landscape, and the threat of discovery and capture. It’s a long, dangerous trip to the Indian border and safety—and not every member of the group will survive. This page-turning high adventure introduces young readers to a fascinating part of the world and the threat to its people’s religious freedom. Running on the Roof of the World will appeal to fans of such topical survival adventure stories as A Long Walk to Water and Never Fall Down. Can you still have a home if you don’t have a house? In the spirit of The Truth About Jellyfish and Fish in a Tree comes a stunning debut about a family struggling to find something lasting when everything feels so fleeting. Twelve-year-old Della Kelly has lived her whole life in Maryville, North Carolina. She knows how to pick the softest butter beans and sweetest watermelons on her daddy’s farm. She knows ways to keep her spitfire baby sister out of trouble (most of the time). She knows everyone in Maryville, from her best friend Arden to kind newcomer Miss Lorena to the mysterious Bee Lady. And Della knows what to do when the sickness that landed her mama in the hospital four years ago spirals out of control again, and Mama starts hearing people who aren’t there, scrubbing the kitchen floor until her hands are raw, and waking up at night to cut the black seeds from all the watermelons in the house. With Daddy struggling to save the farm from a record-breaking drought, Della decides it’s up to her to heal Mama for good. And she knows just how she’ll do it: with a jar of the Bee Lady’s magic honey, which has mended the wounds and woes of Maryville for generations. with the help of her family and friends, plus a fingerful of watermelon honey — that love means accepting her mama, just as she is. Roaring Brook has acquired Alyssa Hollingsworth’s debut middle grade novel, The Eleventh Trade. The book is a powerful story of love, loss, friendship and hope, centered around Sami, a young refugee from Afghanistan now building a new life with his grandfather in Boston. But the power of the book is not without consequences, and Emma soon realizes that she isn’t the only one who knows about it. Someone is determined to take it from her ― and they’ll stop at nothing to succeed. A new boy in school ― the arrogant, aloof, and irritatingly handsome Darcy de Winter ― becomes Emma’s unlikely ally as secrets are revealed and danger creeps ever closer. American-born seventeen-year-old Maya Aziz is torn between worlds. There’s the proper one her parents expect for their good Indian daughter: attending a college close to their suburban Chicago home, and being paired off with an older Muslim boy her mom deems “suitable.” And then there is the world of her dreams: going to film school and living in New York City — and maybe (just maybe) pursuing a boy she’s known from afar since grade school, a boy who’s finally falling into her orbit at school. Arram Draper is on the path to becoming one of the realm’s most powerful mages. The youngest student in his class at the Imperial University of Carthak, he has a Gift with unlimited potential for greatness — and for attracting trouble. At his side are his two best friends: Varice, a clever girl with an often-overlooked talent, and Ozorne, the “leftover prince” with secret ambitions. Together, these three friends forge a bond that will one day shape kingdoms. And as Ozorne gets closer to the throne and Varice gets closer to Arram’s heart, Arram realizes that one day — soon — he will have to decide where his loyalties truly lie. Meet your new favorite kickass heroine in this daring YA series by New York Times bestselling authors Rachel Caine and Ann Aguirre, a thrilling yet romantic futuristic adventure perfect for fans of Claudia Gray’s A Thousand Pieces of You. Still, when Zara commits a crime that has her running scared, jail might be exactly where she’s headed. Instead Zara is recruited into the Honors, an elite team of humans selected by the Leviathan — a race of sentient alien ships — to explore the outer reaches of the universe as their passengers. But when her home is attacked and her mother kidnapped, Elsa is forced to cross into the real world and use her own scriptology gifts to find her. In an alternative Victorian Italy, Elsa finds a secret society of pazzerellones ― young people with a gift for mechanics, alchemy, or scriptology ― and meets Leo, a gorgeous mechanist with a smart mouth and tragic past. She recruits the help of these fellow geniuses just as an assassin arrives on their doorstep. In this thrilling debut, worlds collide as Elsa unveils a deep political conspiracy seeking to unlock the most dangerous weapon ever created ― and only she can stop it. When everything goes wrong, she and the Ironblood end up as fugitives on the run. Now their entire kingdom is after them — and the coordinates — and not everyone wants them captured alive. What they find in a lost corner of the universe will change all their lives — and unearth dangerous secrets. But when a darkness from Ana’s past returns, she must face an impossible choice: does she protect a kingdom that wants her dead or save the Metal boy she loves? Cameron’s cosplay creations are finally starting to earn her attention — attention she hopes to use to get into the CalArts costume design department for college. But after she wins a major competition, she inadvertently sets off a firestorm of angry comments from male fans online. Unfortunately, the only comic shop in town — her main destination for character reference — is staffed by a dudebro owner who challenges every woman who comes into the shop. and her feelings for Lincoln threaten to make a complicated situation even more precarious in this geek girl anthem from You’re Welcome, Universe author Whitney Gardner, complete with fully illustrated comic pages inked by Gardner herself. Enne Salta was raised as a proper young lady, and no lady would willingly visit New Reynes, the so-called City of Sin. But when her mother goes missing, Enne must leave her finishing school — and her reputation — behind to follow her mother’s trail to the city where no one survives uncorrupted. Frightened and alone, her only lead is a name: Levi Glaisyer. Unfortunately, Levi is not the gentleman she expected — he’s a street lord and con man. Levi is also only one payment away from cleaning up a rapidly unraveling investment scam, so he doesn’t have time to investigate a woman leading a dangerous double life. Enne’s offer of compensation, however, could be the solution to all his problems. A romantic, cinematic, richly-imagined retelling of the classic Jane Eyre set in space, about seventeen-year-old Stella Ainsley, a mechanic who takes a governess job on board the private ship, the Rochester and falls in love with the ship’s mysterious and troubled captain. For Marissa Meyer and Kiera Cass fans. Seventeen-year-old Stella Ainsley wants just one thing: to go somewhere — anywhere — else. Her home is a floundering spaceship that offers few prospects, having been orbiting an ice-encased Earth for two hundred years. When a private ship hires her as a governess, Stella jumps at the chance. The captain of the Rochester, nineteen-year-old Hugo Fairfax, is notorious throughout the fleet for being a moody recluse and a drunk. But with Stella he’s kind. Unfortunately for Demon Heart, when the video of the disastrous Q&A goes viral, the producers have a PR nightmare on their hands. In order to help bolster their image within the LGBTQ+ community — as well as with their fans-they hire Claire to join the cast for the rest of their publicity tour. What ensues is a series of colorful Comic-Con clashes between the fans and the show that lead Forest to question his assumptions about sexuality and help Claire come out of her shell. But how far will Claire go to make her ship canon? To what lengths will Forest go to stop her and protect his career? And will Claire ever get the guts to make a move on Tess, the very cute, extremely cool fanartist she keeps running into? Ship It is a funny, tender, and honest look at all the feels that come with being a fan. A powerful teen novel set in Zimbabwe about hope – and how it can heal a family, a friendship, perhaps even a nation. Shamiso’s eyes popped. She had heard this quote once too often. Those were her father’s words. His grand exit; an articulate heartfelt piece that Shamiso had read so many times she knew every last line. For fifteen-year-old Shamiso, struggling with grief and bewilderment following her father’s death, hope is nothing but a leap into endless darkness. For her new friend Tanyaradzwa, recently diagnosed with a terrible illness, hope is the only reason to keep fighting. Rutendo Tavengerwei’s extraordinary debut takes a honest look at hope, and the grit and courage it can take to hang on to it. Adeluna is a soldier. Five years ago, she helped the magic-rich island of Grace Loray overthrow its oppressor, Argrid, a country ruled by religion. But adjusting to postwar life has not been easy. When an Argridian delegate vanishes during peace talks with Grace Loray’s new Council, Argrid demands brutal justice — but Lu suspects something more dangerous is at work. Devereux is a pirate. As one of the outlaws called stream raiders who run rampant on Grace Loray, he pirates the island’s magic plants and sells them on the black market. But after Argrid accuses raiders of the diplomat’s abduction, Vex becomes a target. An expert navigator, he agrees to help Lu find the Argridian — but the truth they uncover could be deadlier than any war. Benat is a heretic. The crown prince of Argrid, he harbors a secret obsession with Grace Loray’s forbidden magic. When Ben’s father, the king, gives him the shocking task of reversing Argrid’s fear of magic, Ben has to decide if one prince can change a devout country — or if he’s building his own pyre. “The Maze Runner meets Memento” (Jeanne Ryan) in The Echo Room, a smart, claustrophobic, speculative thriller with an immersive psychological mystery for teens, by Parker Peevyhouse. A YA thriller about a teen who wakes to find he is trapped in a mysterious shelter with a girl who is either sabotaging his every attempt to escape or who holds the key to his freedom. What books in 2018 have you most excited? Tell us about them in the comments!